His Splash Hospitality company offers hotel asset management and business turnaround services, covering the whole gamut of the hospitality sector from pubs and nightclubs to hotels and accommodation centres. His latest project is the Mimozas Resort. Comprising a development of 280 4-star apartments, it’s one which he seems to be particularly enthused about. Located near the town of Mandelieu-la-Napoule (just around the bay from Cannes), it’s in an area of stunning beauty and serenity on the busy tourist hub of the Côte d’Azur. “I came across it initially because there’s quite a strong connection between the resort and a lot of Irish people who have bought apartments there,” says Ray. “The resort is open about 10 years and it’s one of those resorts that was legacy of the Celtic-Tiger-fuelled ideas where the thinking was that you could buy a little place in the South of France and make it pay its way by renting it out as well as using it for holidays. “It was through meeting some of the owners that I came to know about it. They weren’t happy with the management that had been there up to now and the opportunity was there. They said that they liked what we do in Ireland and felt that it would work in France too. Ray has explored a lot of France over the years and Alsace is a region that he cites as one of the more quirky and relatively undiscovered parts of the country. Splash Hospitality’s portfolio already includes Wineport Lodge outside Athlone (famous to anyone who watches “The Restaurant” on TV3 and formerly on RTE) and the Ice House in County Mayo. Like Wineport Lodge, Mimozas Resort is set around a shimmering lake, and the similarities won’t end there as Mimozas Resort team will endeavour to offer guests the friendly welcome and warm hospitality they have come to expect from Ray and his crew. After about 10 years of successfully running Wineport Lodge, Ray turned his Midas touch to a number of other projects in the early 2000s. These included Lisloughrey Ldoge in the grounds of Ashford Castle and The Icehouse in Ballina. Then, as the economy was recovering around 2012/13, a further change of gear saw Alan concentrating on managing businesses that had sustainable growth for the future. On his company website, Ray describes himself as a “serial entrepreneur”. Just what is that? “A serial entrepreneur is someone who can’t help himself getting involved in things that they should learned to say ‘no’ to in the first place,” he jokes. “I am very enthusiastic and if someone comes along with an idea, I can’t help myself from digging my oar in somewhere along the line, so it does become a bit ‘serial’. The circumstances that led Ray to embrace this project in France may well be repeated in other parts of the country. Many properties within easy reach of an international airport were bought up by Irish investors, making the likelihood of more “Mimozas” a very distinct possibility for Ray over the coming months and years. Bright calm future ahead: Is Mimozas to be one of many Irish-owned/Irish-managed French holiday accommodation centres to come? And, with the increased numbers of flight connections currently being experienced in a rising Irish economy, the good news is that more and more of these Irish-owned/Irish-managed accommodation centres will be more accessible than ever for Irish holidaymakers. For those looking to get away from it all and try Mimoza, there’s a super low introductory rate of €399 for a three-night stay from the 29th of December. 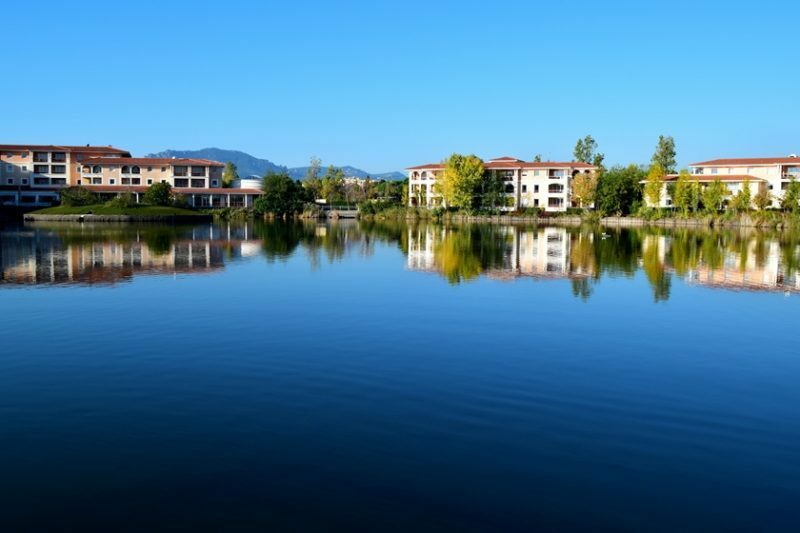 It could be a great way to celebrate the New Year: each spacious apartment comes well decked out and has its own private balcony overlooking either the lake or the Old Course. Cannes city centre is just a 10 minute drive from the resort, so you’re not far from the action for la St Sylvestre (New Year’s celebrations in France). Cannes, so long the destination of choice for the rich and the famous, comes alive on New Years Eve, with a packed schedule of activities ending with an incredible fireworks display at midnight. Gather your loved ones (and a bottle of bubbly) and find a spot along the famous La Croisette to watch the pyrotechnics. See www.mimozascannes.com for details and booking.